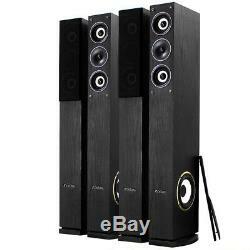 4x Fenton Home Hifi 6.5 3-Way Column Floor Standing Speakers 2000W UK Stock. If you are looking for a great sounding hifi package then this is just for you. Including four of the latest high quality Fenton speakers for an outstandingly crisp and clean sound with plenty of volume this bundle is ideal for home stereo use with CD and record players as well as working perfectly as part of a home cinema system. 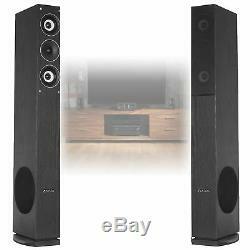 BBA0948 - Pair of Fenton 6.5 3-Way Black Hi-fi Column Speakers. Introducing this fantastic pair of elegant 3-way tower speakers from Fenton. Unlike most home hi-fi speakers, each of these slick black speakers come with an innovative design in the form of a standard 1 inch tweeter and two 3 inch mid-range woofers found at the face of each speaker. But what really makes these hifi units special is the built-in side-subwoofer on either side of each speaker, allowing users to enjoy their relaxing music sessions and intense home cinema experiences with a deep, rounded bass sound as well as high quality mids: guaranteed to impress you and your guests on those not-so-quiet nights in. Frequency response: 20Hz - 20kHz. Woofer: 6.5 Side subwoofer. Dimensions: 250 x 120 x 1035mm (per piece). Weight per piece: 7.1kg. A tracked service is available when you select a 48 hour or 24 hour courier service. Due to our carriers charging extra for Highland and Islands, we need to pass this charge onto our customers. Where do you deliver to? We deliver to the UK, Ireland and internationally covering most of the EU, including. All deliveries will require a signature so please ensure someone is present to sign for the item. The couriers will try and deliver the item twice before returning the item to us. Sound and lighting equipment can be very technical, and there are some simple practices to avoid unintentional damage to your equipment. We also request that you return the goods to us in its original packaging where possible. Our welcoming Sales Team are experts in all aspects of the entertainment industry. We will listen and discuss your ideas, doing our best to help and advise you with what product would be ideally suited for your requirements. If there are any additional costs you will only be charged the difference between the original order and the new order. This is so that we can offer you the highest quality Customer Service and we are able to track your return when it is received into our warehouse. How do I find the item number or product code? The product code of the item is displayed in orange text to the right hand side of the main image in the description. It will be displayed as a seven-figure code e. Can I amend my order? We are open 6 days a week, excluding bank or public holidays & annual holidays. The item "4x Fenton Home Hifi 6.5 3-Way Column Floor Standing Speakers 2000W UK Stock" is in sale since Thursday, September 28, 2017. This item is in the category "Sound & Vision\Home Audio & HiFi Separates\Speakers & Subwoofers". The seller is "essex-disco-supplies" and is located in Thurrock, Essex. This item can be shipped to European Union member countries.